Here is the game menu from our game, Cardinal Fall, for use by the community. This project packages a combination of other community projects to create a single, easy to implement menu system. We will do our best to update the project with new engine releases. 3rd Party Assets are discussed in the credits section below. More up to date information is available in the Readme. This project was put together by Metahusk using a collection of community content. Please credit everyone listed here and provide a link to our websites. Please provide credit where credit is due. You must credit the following people listed below. You can find this information in the project’s readme. The online browser utilizes mordentral’s Advanced Sessions Plugin. The key binding system utilizes Rama’s UMG Rebindable Key System, Rebind keys at Runtime. The music used in this project is owned by The Tune Peddler. You do not have permission to use the project’s music without agreeing to the terms at The Tune Peddler’s website. As of July 2016, this includes a $5 a month subscription fee. The LoadingScreen plugin was provided by Nick Darnell and was released under The MIT License. Respond to this thread below with your ideas. If you have a bug fix, would like to contribute, or expand on this project, please say so. We will contact you and grant you commit privileges on the repository. Our organization is a IRS 501(c)(3) recognized tax exempt nonprofit. We will provide written (emailed) donor acknowledgment letters to those who donate $250 or more to our organization as required by the IRS. Our apologies to donors outside of the United States. We will not be able to provide you with any tax benefits for donating to our organization. 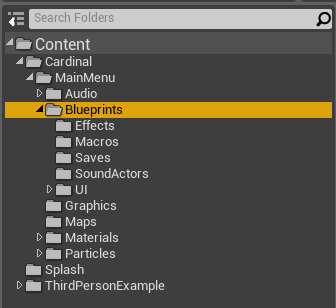 Create a Project Directory folder in your Unreal 4 Projects Directory. 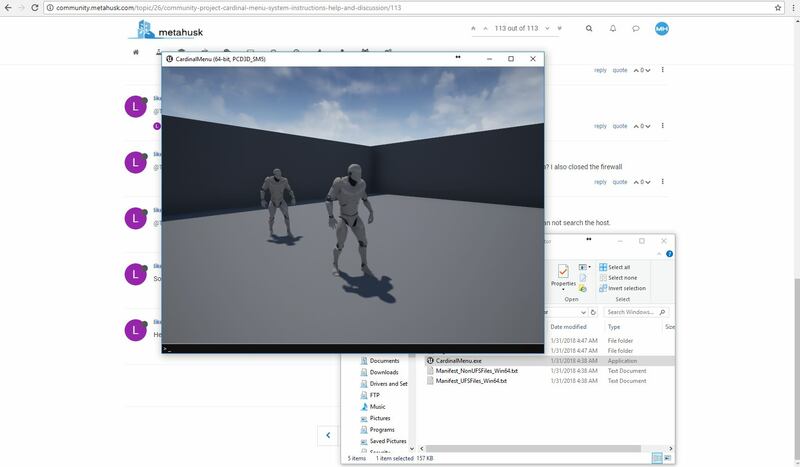 Download the project or Clone the development files to your Unreal 4 Projects Directory using your favorite mercurial client. Plugins Directory Structure: \Your_Directory\Plugins\VictoryPlugin"plugin files"
Plugins Directory Structure: \Your_Directory\Plugins\MainMenuLib"plugin files"
Plugins Directory Structure: \Your_Directory\Plugins\AdvancedSessions"plugin files"
Plugins Directory Structure: \Your_Directory\Plugins\LoadingScreen-master"plugin files"
Plugins Directory Structure: \Your_Directory\Plugins\GamepadUMGPlugin"plugin files"
Plugins Directory Structure: \Your_Directory\Plugins\PingPlugin"plugin files"
Plugins Directory Structure: \Your_Directory\Plugins\VaRest"plugin files"
Right Click on cardinal.uproject and click Generate Visual Studio project files. Execute cardinal.uproject and click Yes to Recompile Project Modules. NOTE: To utilize Steam, you must launch as a "Standalone Game" or utilize a packaged build both with Steam running. Open your project's Project Directory folder in windows explorer. Download the project files from the webpage. Convert your project to a C++ project if it's a Blueprint Only project. Navigate to \Your_Directory\Content and extract the \CardinalMenu\Content\Cardinal and \CardinalMenu\Content\ThirdPersonExample and \CardinalMenu\Content\Movies into your project's content folder. Navigate to \Your_Directory and extract the \CardinalMenu\Plugins folder into your project's root directory. Right click on \Your_Directory\YourProject.uproject and select Generate Visual Studio project files. Open YourProject.sln, in Solution Explorer (typically located on the right) right click on Games and select Build. Execute cardinal.uproject and click Yes to Recompile Project Modules, if asked. Open Project Settings and select Maps and Modes. Set Game Default Map and Editor Startup Map to MainMenu. Set Default GameMode to ThirdPersonGameMode. Set the Game Instance Class to BP_GameInstance. Restart The Editor and click Yes to Recompile Project Modules, if asked. Set Up LoadingScreen by opening Edit -> Project Settings -> Game -> Loading Screen. Under Startup Screen Uncheck Auto Complete when Loading Completes, Check Movies are Skippable, Uncheck Wait For Manual Stop, Uncheck Show UIOverlay. 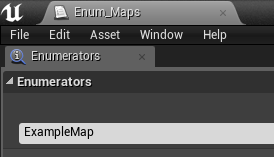 Go to Movie Paths and add UE4Logo and MetahuskIntro to the array. Under Default Screen Check Auto Complete when Loading Completes, Check Movies are Skippable, Uncheck Wait For Manual Stop, Uncheck Show UIOverlay. Go to Movie Paths and add LoadingRed to the array. 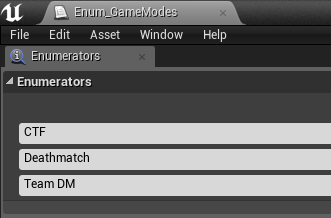 Insert your GameModes into Enum_GameModes, list your available map names to Enum_Maps, and set your server host's preferred maximum number of players to Enum_NumberOfPlayers using the supplied pattern. 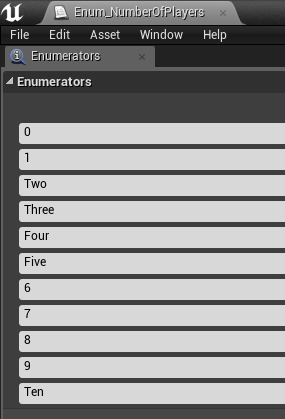 For skipped number of player options, use the enumeration's integer. For the number of players option you'd like available, spell out the integer. In order for key bindings to work on packaged builds, you must copy Input.ini from inside your project to the build directory. The paths and default bindings are listed below. Input.ini does not copy into the directory by itself. The default bindings are shown below for your convenience. Open the Designer tab on the Widget and then navigate to SettingsButtonsLine in the Hierarchy. In the Details tab and in the Default section and then under ButtonsNames you will see an array of the names. Change these names to change the button names. Open the Graph tab in the widget. Open the function called OpenDetailsContainer. Bug: Client Returning to "Main Menu" can't join another game. Bug: Some listen servers do not respond to ping, instead respond with "?" Fix: Listen server host's network configuration (firewall or router) do not respond to ICMP Pings, likely due to host's configuration. To show pings, host's router must respond to ICMP Pings. Many routers have this disabled by default. It doesn't seem like the server lines update the number of players that are in a server, you just set TOTPLAYING to 1 and then it never gets updated. Am I missing something? The logic for the total players has to be put into game state and the Steam session has to be updated. We haven't included that logic as of yet. (Just like level transitions and so on) Basically the online session gets broadcasted once when you create the server and the gamestate never updates it. It's not too hard to implement. You just need to count the number of players in your game and update the online session to reflect this every time someone joins and leaves the game. We are working on a game right now. 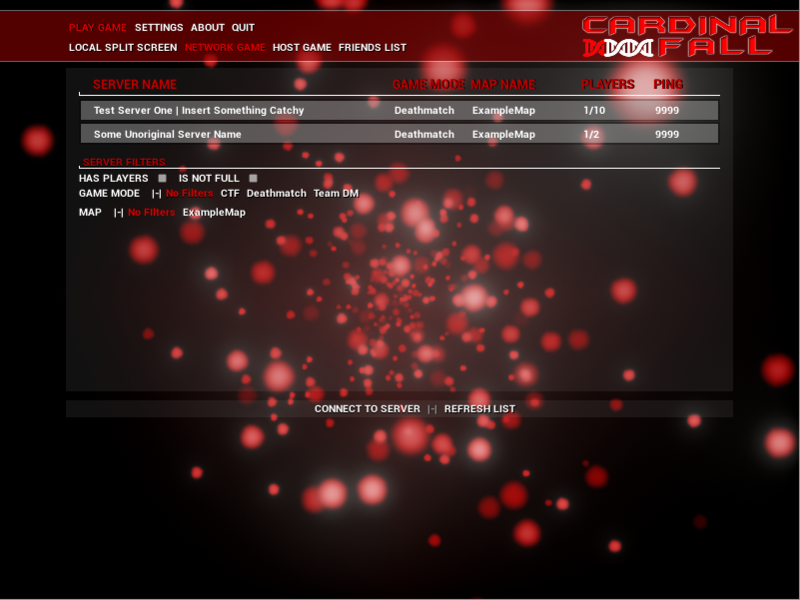 When I implement that into our game I will copy the BP nodes into the Cardinal Menu project and share it. It just hasn't been built yet. Thanks for trying the project! I should probably mention that in the documentation. I hope to have that feature implemented in a month or so. Thanks Thaddeus, appreciate the explanation. I've been working on my own game myself and tried getting the current players in a server just by dragging a "Get Current Players" function off the find sessions advanced results which works for LAN but always returns as 1 for some reason with Steam. I'll have to try updating it manually like you described above. We just tested 4.13 and the persistent graphics settings need to be reworked. We will probably migrate away from the MainMenuLib plugin. The update may take a while. So far no other bugs have been discovered outside of minor depreciated blueprint functions. We released the project for 4.13 today. I'm not quite sure if the graphics settings will cause issues but so far I've experienced no issues. We will probably slate that fix for the next engine version. Please report any bugs you find. We released a new version. This release includes a simple single player button (as requested), cleans up some of the debug printing to console, and includes a simple map loading video. Why ping steam 9999 ? The project has been released for Unreal Engine 4.14 today. So far there have been no reported bugs. Please let us know if you find any. Thanks. I've had a lot of trouble getting it to work with Steam. It's possible but I've been waiting to see if it gets easier with new engine releases. Great work! Will there be an update to UE version 4.15? Thanks! AdvancedSessionsPlugin was reporting some problems with 4.15. Pretty soon 4.15 we will release a 4.15 version. Hello it is possible to change Axis Mapping? I'm releasing axis mapping and controller support today with the UE4.15 release! It took a while to work the bugs out. The UE4.15 release includes some major changes. Here are some of the major ones. The MainMenuLib was removed and blueprints only graphics settings were put into place using Mathew Wadstein's method. Axis bindings are now possible. Controllers (Xbox and Steam) are now supported. And a UE4 intro video plays at the beginning. Wow! that's awesome work, never would have thought it so fast! You're welcome. Hopefully this saves people a lot of time. Binding can be kind of difficult. The inputs require alphabetical order and sometimes after packaging the game you have to re-order the defaultinput.ini controls back into alphabetical order. The menu system is getting pretty complicated. I forget where things are if I haven't worked with it in a few months. You do not hope. YOU SAVE a lot of time of all people want use your project for prototyping game or something like that. For my mind since i played with ue4 i have seen many community helper giving some tuto you know complete solution to start with and this is very good because when you are indie or even student this type of project i guess "Cardinal Menu" is a gold mine and this can increase significantly your power! I just want to say something last one for people looking for solide base fundation for starting game or any other. this is a MUST USE in his category. Pepito is right, never seen even a package like this. FIVE STARS TO ALL THE MEMBERS!!!! Thanks for the encouragement. We just released a new version that fixes the in editor's default binds being wrong out of the box. 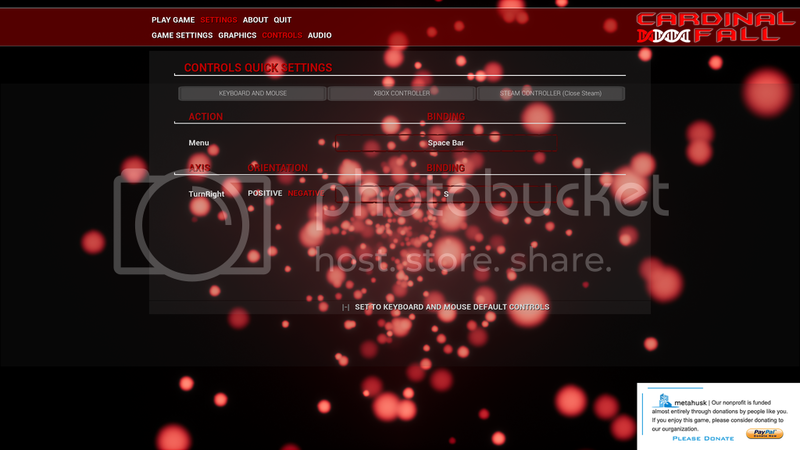 PIE PC controls should work fine now. Steam friend avatars were fixed. 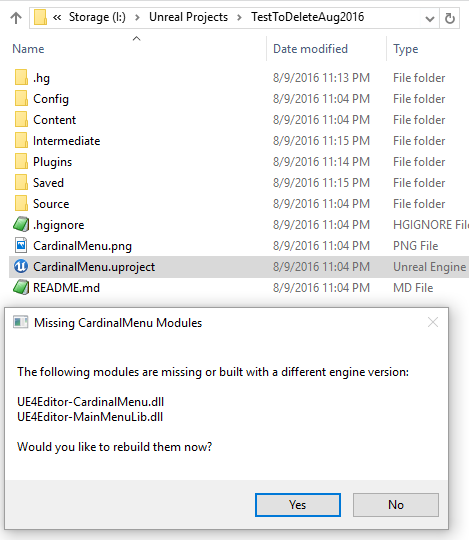 They are not functioning correctly in UE4.15 until Cardinal Menu v170405_415. Hi, I'm triyng to make some test with Cardinal Menu and I found a strange behavior, If you launch 2 PIE windows and on the server windows start a network host and on the client window connect to the server (LAN, no STEAM) the gamemode is not passed to the client and you have olny the default one, just the camera. Is the game instance set? Sometimes it becomes unset for some reason. Especially if you migrate project files. Just for reference in case anyone else has the same problem: The issue was resolved in the discord channel. The problem was Auto Connect to Server being checked under PIE -> Advanced Settings -> Multiplayer options. There is a check if InGameMenu existe "Check If In Game Widget - Can't Use Defaults If In Game"
But this check does nothing ? I would like to know if we can't do something if In Game VS in menu. I'm taking a look. I think it's depreciated. The menu has been in production under a lot of different engine releases. I'll get back to you. Edit: Ah, that part is confusing and could use a lot of rework. Basically the ending parts of the function OpenDetailsContainer remove or rename the buttons on the bottom of the panels The "Apply - Defaults" button. The names are being changed on runtime or they are being hidden depending on what panel is being selected. LocalDetailsPanelID "2" is the Controls panel I believe. We might solve that issue in the future. It's not a huge priority right now, though. I'm not sure if that made sense? Basically, it makes it so the default controls can only be set in the MainMenu. 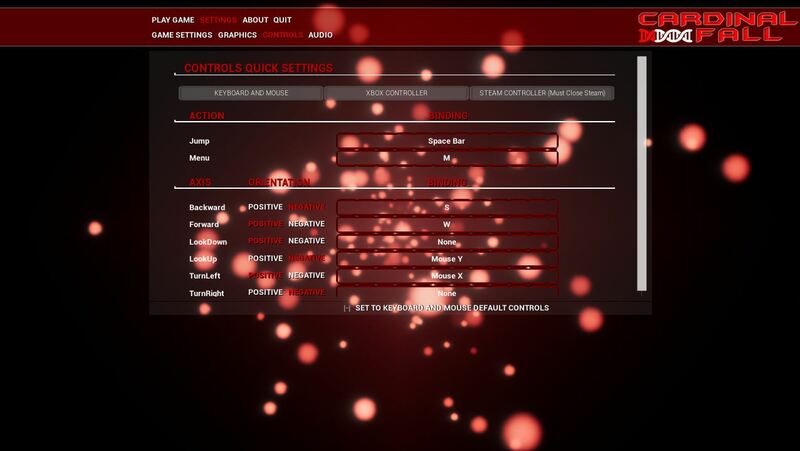 Running through the array of default controls while the game is in progress has caused problems in testing. If that wasn't your question, let me know. I pressed set default controls and it deleted all the controls, how can i come back to normal ? The order matters to the engine. It should be alphabetical. To my knowledge, nobody has come up with a better method without programming one or using a form of real time binds on every tick. (Bypassing UE4's method basically) It's a pain to work with. Good luck! Before changing anything, I'd try closing the editor and launching it again. If you're in a packaged build, check your Input.ini to make sure the binds are there. I have to manually paste them on every build. You have to paste your saved inputs cause they are deleted with new builds ? Also, the arrays holding the default binds have to be exactly the same as the Input.ini. /ProjectSettings/Input doesn't seem to be a good way to modify the binds. Sometimes it doesn't update accurately without launching the editor again. You can find some posts on Epics forums talking about these issues. You're welcome to re-design it if you'd like. There's a reason Rama's plugin works the way it does. I didn't design UE4's input system and I'm definitely not an expert in it. If you mess with it for a few hours, it will start to make sense. https://forums.unrealengine.com/showthread.php?51449-Full-Project-Rama-s-UMG-Rebindable-Key-System-Rebind-keys-at-Runtime! Why is the current number 1? There are 2 people in my room. bug? Why is the current number 1? There are 2 people in my room. bb bug? The menu system has no game play implemented features and as a result the player count isn't updated. You'll have to implement your own session updating blueprints. It would be fairly easy. You just update the session information when the number of players change. How do I update this session information? I see in the node that UpdateSession uses this node to update the information? Is it updated on the server side?! Updatesession failed to update continuously in lan... Is this right? Or BUG? Edit: Hang on, there might be a deeper issue here. My mistake, sorry. I'll post how to get player counts to work. I just tested it in LAN. I need to test Steam as well. For LAN, you can use "Get Max Players" and "Get Current Players" inside "WidgetBlueprint'/Game/Cardinal/MainMenu/Blueprints/UI/PlayGamePanels/ServerList.ServerList'" Functions "BuildInternetListenSearchResults" and "BuildLANSearchResults." I think there are still bugs with this feature in Dedicated Server builds. Edit2: Steam doesn't update playercounts correctly using this method. Session Update and Session Extra Settings method may work though. I'll try that in a bit. Thank you very much. I've already solved the problem. As you said, I'll update session in the game. @Thaddeus-Delude Hello, buddy, do you have a QQ or a WeiXin? Add a regular connection! The project has been released for Unreal Engine 4.16 today. Major changes for this release includes making the Escape Key always open InGameMenu despite binds, the project now updates the number of players currently in session, and fixes the default binds not working when first compiling the project. Also, Victory Plugin and GamepadUMGPlugin still use a TargetInfo argument instead of the new ReadOnlyTargetRules argument and as a result they throw errors. Rama will likely fix this issue soon. LoadingScreen plugin had compile issues in 4.16 and a version a few commits earlier was used instead. The project was updated to use ReadOnlyTargetRules arguments. Please post if you find any bugs. Okay, I understand a bit better now. I guess the "Menu Button Line" does not exist because the RadioButtonLine BP contains errors. All of the construct functions in the widgets have their class undefined. I'm not sure how this happened, but everything is all messed up now. I will try to reimport the files. Hi, everyone! Thank you for the excellent work here! I'm learning a lot! I've integrated the Cardinal menu into my project and I'm having one issue with key bindings. My game has seven action inputs and two of them do not work after remapping for PC. Only three inputs work on an XBOX controller. The working XBOX actions are different than the working PC actions. I have the defaults setup, actions are in alphabetical order, and I see the Input's swap under project settings. The menu system for Unreal Engine 4.17 has been released. It includes an in game return to game button and a debug print to screen fix. when i test the project with not run steam , it cant find hostgame list , LAN not work. do you have this issue ? have somebody test project with LAN ? All of my previous test have worked. I will test it right now. Edit: Strange, it doesn't appear to be working on Ethernet to WiFi LANs on my network. (Could be related to how my network is set up) I'll check Ethernet to Ethernet. I'm looking into it. I've experienced some cases where certain types of network setups didn't show LAN games or took a long time for them to appear. I'm looking into Advanced Sessions Plugin and the BP nodes. I'll hopefully have fix tomorrow. Very little has changed in 4.15-4.17 versions. Edit 2: It works in editor. Looking into network related things. Edit 3: Standalone works as well. Hmm, looking into possible packaged version configuration file problems. Edit 4: Packaged LAN search and join works on the same PC when launching two instances. Going to try ethernet via switch LAN on two PCs. Edit 5: It works on LAN network via wired on a local switch. It did not work on WiFi via WiFi Access Point to a wired client. I don't know why. It must have something to do with how Epic designed the sessions broadcasting over the network. My guess is that there's a broadcast packet that's being blocked by my access point. Did you try LAN over wired networks? Or did you use WiFi? The menu system for Unreal Engine 4.18 has been released. Hmm, I didn't experience that problem. What version did you test? What region of the world are you in? How are you testing it? Are you testing LAN on a wired network or wireless? Separate devices? Did you investigate routers for port forwarding issues with steam? I tested the project locally in the Midwest of the United States and also on a wired switch using laptops and a desktop. Discovering sessions on a LAN can take a while. I wonder if your Steam problem has something to do with the test App ID and what region you are located in? They are region locked to my understanding, meaning you have to test it in the same geographical location unless you have your own App ID. On LAN, were you working on WiFi? LAN uses Epic's default online subsystem and I've had problems with it on some networks depending on how they are configured. The project uses Advanced Sessions Plugin. Maybe your answer is in there? Thanks for checking out the project. Hopefully you find something useful about it. Hi there, I get this error everytime I try compiling with Visual Studio 2017. It does not let me do so with 2015, it says that the project is incompatible with that Visual Studio version. Any help would be greatly appreciated. Thank You. 2>C:\Program Files (x86)\Microsoft Visual Studio\2017\Community\Common7\IDE\VC\VCTargets\Microsoft.MakeFile.Targets(44,5): error MSB3075: The command ""C:\Program Files\Epic Games\UE_4.18\Engine\Build\BatchFiles\Build.bat" CardinalMenuEditor Win64 Development "D:\CardinalMenu_Project_v171227_418\CardinalMenu_Project_v171227_418\CardinalMenu.uproject" -waitmutex" exited with code 5. Please verify that you have sufficient rights to run this command. 2>Done building project "CardinalMenu.vcxproj" -- FAILED. @Thaddeus The previous test was correct, and it was not correct to start the test after yesterday. @Thaddeus 4.14 version, I was in Chongqing, China, wired network, different computer test, opened steam, set up a host computer, other computer connections failed to search for this host. It was all right before, it was yesterday, the test connection was not up, the search was not the host. Do you have any contact? I found that there is a problem, joinsession, join the success, but will not jump to the new map, the local area network can, steam is not. @rexregum I have problems with VS2017 on all my projects. I'm not sure if it's a problem with a specific plugin or UE4 and VS2017. I spent days trying to figure it out to no avail. I'm not sure the answer on that, sorry. Are you packaging / building your own copy of the game? Or is the Demo not working? Have you tried a newer version than 4.14? You can contact me on here or on Discord. The top of the forums have a link to the Discord channel. I don't know how much assistance I can provide, though. You might just have to experiment with the project and see what the issue is. I test each build before they are released. The 4.18 build should work without issues. If you need 4.14 specifically, I can go back and check it to make sure it works. It's been a while since I worked with that version of the engine. @Thaddeus Well, the previous 4.14 was normal. Do you mean 4.13 didn't have any issues? CardinalMenu_Project_v161019.zip? The 4.16 and newer version have a lot of improvements, by the way. Also, you might want to check and make sure that the game instance is set to BP_GameInstance in Project Settings -> Maps and Modes -> GameInstance Class. @Thaddeus Ask a question, the use of a compiled engine can be a normal search, the use of the source code to compile the engine can not search the host. Source code compiled steam, can not search the host, excuse me why? Well, thank you, because I am the engine compiled with the source code. I can not search it by packing it, and you can search it with a compiled engine. Can you try using source code to test it? I found the problem of source code, UE_LOG_ONLINE (Warning, TEXT ("Removed incompatible build: ServerBuildUniqueId = 0x%08x, GetBuildUniqueId (= = 0x%08x"), Session.SessionSettings.BuildUniqueId, 0x%08x); the 2 ones are not equal. Hey so I just downloaded the latest version of cardinal menu (4.18), and I seem to be having problems with the controls settings not fully showing up on a packaged version of the game which seems to break the characters movements within the example map. I have checked the defaultinput.ini file within the packaged game and the axis and action mappings are there in alphabetical order. The controls show up just fine within the standalone game when in editor but not sure why it's breaking for the packaged game unless I'm missing something. Any ideas? Hmm, that's strange. I've seen a lot of weird bugs with the control mapping lately. I'll look into it. 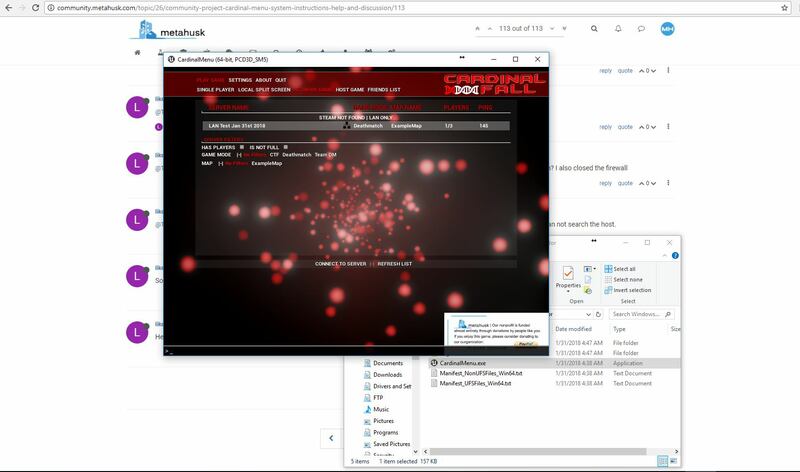 Edit: I just tested CardinalMenu_Demo_v171227_418 and the bindings were present. Is this happening when you package the uProject Files or when you download the Demo? @Thaddeus It's happening when I package the .uproject. It works fine within the editor when playing standalone or launching the game but once I package it, it breaks. You have to manually drop the config files into the packaged directories once it's done. Below is where I put them in the demo to get it to work. For some reason the editor doesn't automatically place them when you package. Did that work? You might have to create some directories if they are not automatically present. @Thaddeus That fixed it, thankyou! I also have another problem that showed up when testing the packaged build with my brother over steam. When I went to host a game he was able to see it in the server list but when he went to double click it it threw an error saying couldn't connect to server. Then I tried to join one that he created but it never showed up for me but rather showed the game I made and said that he was within that game. Tried reloading the game to see if that would fix the problem but still ran into the same server listed. Also not sure if you fixed it or not in an earlier version but the ping was showing 9999 still. There's still no fix for the 9999 ping bug. I use the ping plugin on the main project for it, though, and broadcast the hosts IP as a session variable. The problem is Epic hasn't implemented pings for listen server sessions. Those are the three issues I've seen. Was your multiplayer session broadcast test over LAN with WiFi? Or over the internet? 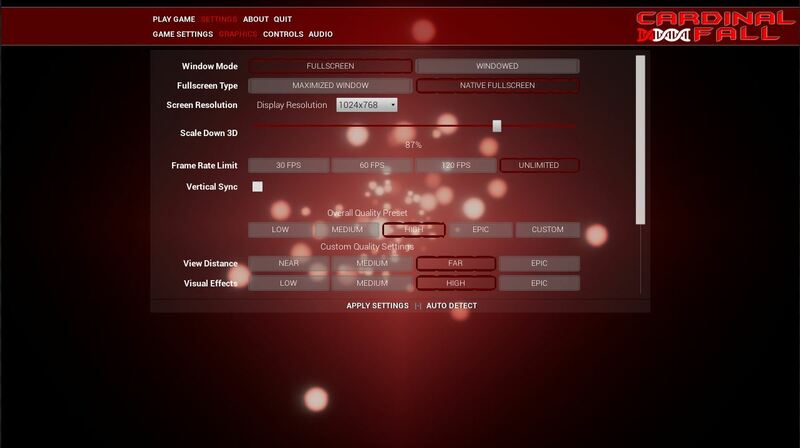 @SkillzKilli I'm glad to know that fixed your inputs! The input system has been quite the headache. I hope Epic changes the way it works soon. But I think they are more concerned about the serious engine stuff. @Thaddeus it was over the Internet, we were in the same state just 500 miles apart so I don't think the region thing shouldn't be an issue (Washington state). Could be something with our firewalls but not too sure on how to check if that's the culprit? I can test more when I get home from work tonight. I'm also using the test appid for this. It's likely a firewall issue if nobody is reporting problems with Steam's test appid. I've heard a lot of problems with in in China, but not here. It is possible that maybe there's too many people using the test appid at the same time when you tested it. I can't remember off my head, but OnlineSessionPlugin only fetches so many sessions by default. The way the server browser works is by filtering out all non-matching sessions. That could be the issue. Or a firewall issue. If you find out that it's a firewall thing and you plan on releasing a big commercial game, I think UWorks does NAT punchthrough. (To bypass firewalls without configuration) I haven't tried it since it's $109 on the marketplace, but I hear it's pretty good. @Thaddeus sounds good, thanks for the help and information. I'll keep you posted If I find any other bugs that want to pop up during testing. @SkillzKilli Thanks for helping report bugs. @SkillzKilli It's the LoadingScreen plugin. The configurations are in there. I'm not sure if it's dated by now. There may be better methods now. But it works. select the folder with the project : CardinalMenu_Project_v171227_418 and the name : CardinalMenu_Project_v171227_418. But I get an error and it does not allow me to clone it. What I'm doing wrong? Please help! 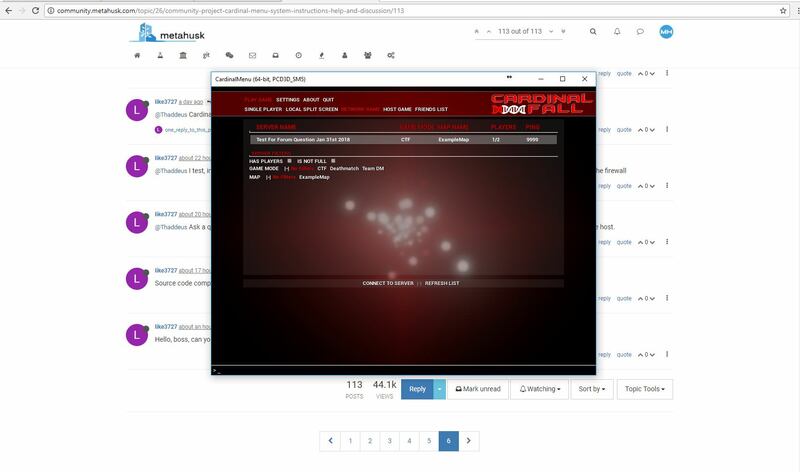 You can download the project files at http://metahusk.com/cardinal-menu/ if you want. Are you looking to clone the repository so you can roll back to different changes? That's weird, I can clone it without a problem using TortoiseHg and this command. I'm waiting for it to finish as I type this. (Edit: It cloned without issues.) I had a problem with SourceTree in the past. Maybe it's a SourceTree bug? hg clone --verbose http://repositories.metahusk.com/menu.hg "I:\Unreal Projects\menu.hg-clone"
@Thaddeus Your Tips helped, it worked on TortoiseHg. There are some issues I need to fix, but for now, this is good enough. Thank you very much! I'm glad to hear it worked. Thanks for replying with your findings. The video on the first post has been updated to reflect the 4.19 version of the project. Does this support Inviting friends directly via Steam? At the moment, it doesn't. I might look into adding that feature in the future. There is a Steam friends list in game, though. Thanks. I got an issue where if I am not hloding down mouse1 I cannot look or move around in the game when spawned jn the level. 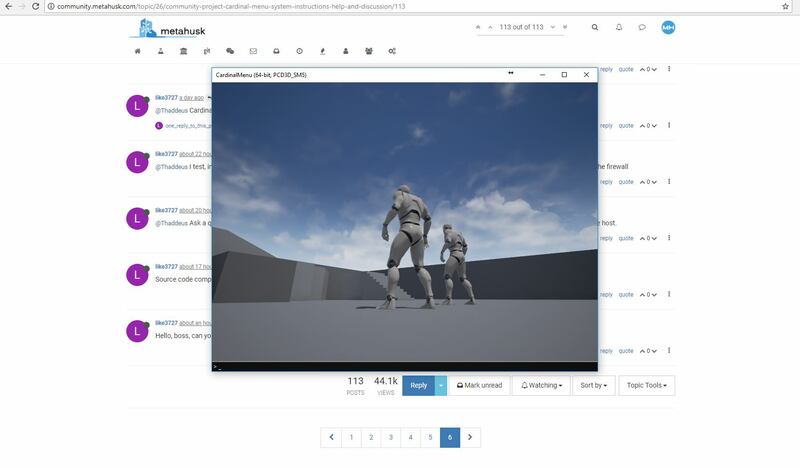 Are you playing the packaged / built demo or in-editor? Windows 10? It sounds like maybe the window isn't selected? I'm not sure what is wrong on your end. How does one go about opening the In Game menu? I got it to open biut then it would not close or return to the game for example. I do not purely understand the logic here..can you elaborate a little on how this works? I saw you made something on the M keypress but what exactly happens there or how do we implement this? Sorry for all the trouble but I am new to UE4. Actually I guess the open/close menu is implemented in the test level you included with the menu itself. I'll try looking there for the implementation and then report back if I still can't get it to work. The blueprint ThirdPersonPlayerController has an event called CreateinGameMenuWidget on construction. There's also an action binding that opens and closes the window in the same blueprint. Basically, that action binding flip flops from showing and hiding the widget while also showing and hiding the mouse cursor. Edit: I was just able to open the project freshly cloned from the repository using 4.19.2's launcher edition on Visual Studio 2015. I'll try the compressed download copy next. Edit2: I'm getting strange problems with the downloaded project and 4.19.2 as well. I'm not sure what the problem is yet. I'll get back to you. Edit3: Turns out I have an issue with Windows Search Service and Win10's built in explorer's unzip program. It didn't decompress all the files. The downloaded version of the project compiled on 4.19.2 with VS2015 without issues. I'm not sure what your problem is. Are you using Visual Studio 2017? I've had problems with it in the past. If i install it to a new project from the zip you give how do i change the name of the game from Cardinal Menu to my own project name? Sometimes there are small changes in the engine that require a bit of tweaking to the directions. Basically find any reference to the old name and replace it with your name. Either in the code or in the project filenames. 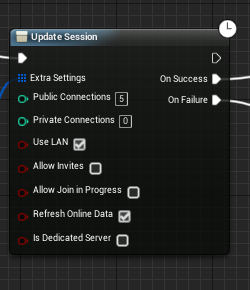 When i go to friends list or network in game menu it says connection failed how do i fix this i made a new project just with your files like the steps said so dont know why it ant working. if i hit shift+tab it shows me steam but says im playing spacewar? if thats working shouldnt it work on the friends list and network and how do i hook the sever side up to steam severs with my own name not spacewars. @playstationkings Spacewar is the Steam test app ID 480 game. You'd need to get a steam app id. "Spacewar" is also region locked, so sometimes your friends won't appear correctly. It's only for testing steam integration, not to launch a game. Ok is there a way we can talk one on one? I went ahead and paid for my steam partnership and so i can make games for steam and get my own storefront and app-id but need some help setting up the the project. Do you have a chat we can use to talk.. email is to slow want to get this project moving but need some help with it but we can get more in to the details in a chat. @playstationkings What details do you want to go into? Troubleshooting is discussed here so other people can read through the posts and find answers that might have already been addressed. 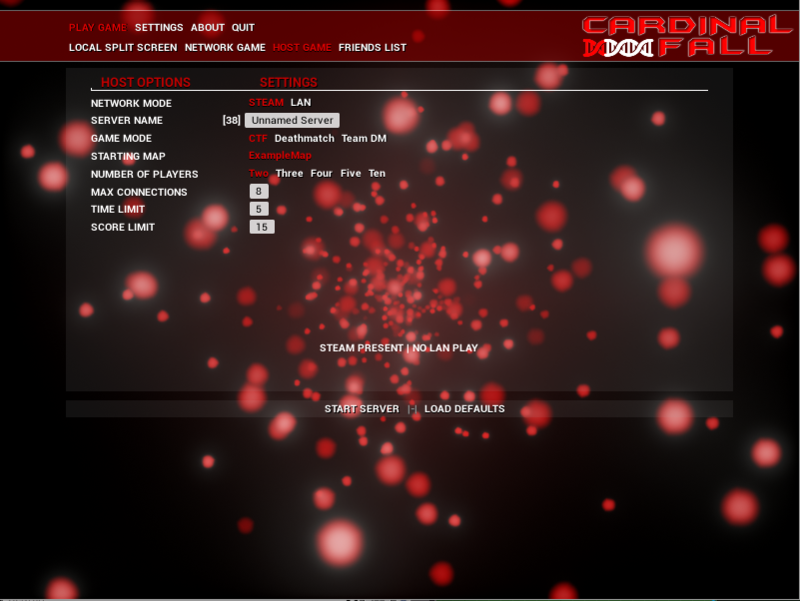 Ok i made a UE4 Source build on 4.19.2 i made a project and add your menu to it following HOW TO IMPORT CARDINAL MENU TO YOUR PROJECT guide. I got the game to play as standalone game and when i play and hit shift+tab i got it to work with my app-id now it shows my game name instead of SpaceWar but when i go to friends list or network or any thing that has to do with a server it says fail to connect how can i fix this. @playstationkings So your hosted server shows up on the list of servers but when a client clicks to connect to the server it fails to connect? Or a firewall is blocking connection to the host. You're using two different steam accounts to test a client joining the host, right? To help troubleshooting, I'd take a look at the project settings in an unmodified version of the project. I've forgotten to set some of them before. I've also seen the values randomly change too and I'm not sure why. 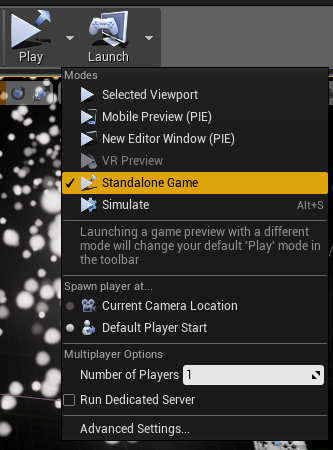 If you're running the game in editor and not a packaged / built copy of the game, make sure you're playing as "Standalone Game" and not "Play In Editor." Also, as a side note: In WidgetBlueprint'/Game/Cardinal/MainMenu/Blueprints/UI/PlayGamePanels/HostGame.HostGame' is where the Steam session properties are set. 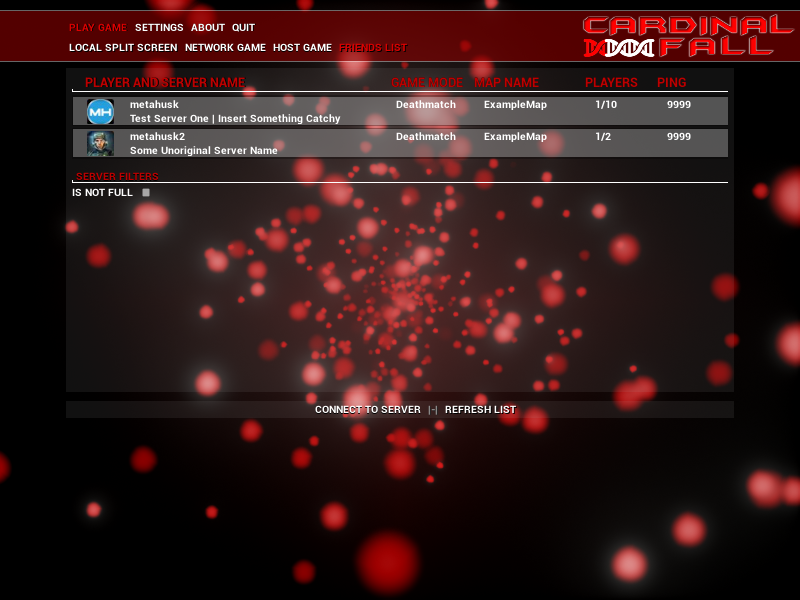 The server browser looks for those properties when making the list of hosted games. That's where you can modify those settings. The forums are now back online. The server hosting our services suffered a drive failure and the system had to be shut down to rebuild the array. The project was released for Unreal Engine 4.20 a few days ago. This version fixes issues with controller joystick movement input breaking after returning to the main menu and the need to manually place control input config files into your packaged game. Let us know if you find any bugs. Hi, sorry to bother you. I'm using 4.19 version of your project and I tested Steam Party with 3 different computers and everytime it doesn't show ping of session, always show "-". Client successfully receive host ip address (I checked via print screen function). Does this happen to you? I know that Unreal have problem with Steam ping so we have to use additional plugin. BTW keep up the good work! Are you testing them on different networks with a separate WAN address? It happens on a lot of people's networks because it's ICMP pinging the router and a lot of routers reject ping requests for security reasons. I turn on "respond to pings" on my router. (Some routers don't give this option for some reason, they just reject all pings. They get rejected to stop botnets from scanning the internet for live IP addresses.) The ping method in this project doesn't do a NAT punchthrough for the ping on the local client, it's just a simple ping to the WAN address. On the networks I've tested: Most public WiFi's I've tried seem to respond to pings, such as Starbucks. My cellular hotspot does not allow ICMP pings to pass, I imagine this is standard on cell networks. PfSense routers do not allow ICMP pings. Most century link routers I've tested do allow pings to go through. Maybe we should put an explanation on the network search tab in the game. I tested every case, ethernet to wireless, ethernet to ethernet, and wireless to ethernet. Computers are not in Lan, each is 2km away. I can't find that option in router. Thank you for quick respond, it looks like it's not a problem in us (blueprints). Maybe we will have to look into a different solution to run pings. I really don't know the percent of routers that will allow ICMP pings or not. If your game will run mostly dedicated servers, the method will probably work better because then there's usually a direct connection or forwarding involved. The dedicated server I test with has been working well. It does take a few seconds to display the ping, though. I have a problem to find where i can change name of the playgamepanel and delete the split screen button from the menu. Hi, I logged in to your site, both with Chrome and Firefox, but if I click on the spoiler image, it will not show me anything. Both Chrome and Firefox are updated. Buongiorno, ho eseguito l'accesso al vostro sito, sia con Chrome che Firefox, ma se clicco sull'immagine degli spoiler, non mi visualizza niente. Sia Chrome che Firefox sono aggiornati. Sorry, we are having issues with php on our host. I've been working to resolve them. I hope to have it resolved soon. Edit: The main website at metahusk.com is experiencing random 500 errors due to php problems. I was incorrect saying that the php problems were related to the forums at community.metahusk.com. They are hosted on different servers. To solve your issue, I disabled the spoilers. I thought I had fixed the issue as I no longer see that problem on my end on Chrome or Firefox but apparently it is not resolved. I noticed a bug with the source build of Unreal Engine version 4.21.0 that stops Steam clients from joining a server due to a false "out of date client" error. Using the launcher version of the engine does not have this issue. I think it may be a problem in 4.20 as well but I haven't confirmed it. The project has been released for Unreal Engine 4.21 today. My bad i have DL 4.20. The project work, perfect ! Thanks for getting back to us. Goodluck with your project. I've also tried using VS 2017 now and still have the same problem. 1>Using Visual Studio 2017 14.16.27023 toolchain (C:\Program Files (x86)\Microsoft Visual Studio\2017\Community\VC\Tools\MSVC\14.16.27023) and Windows 10.0.17763.0 SDK (C:\Program Files (x86)\Windows Kits\10). 1>UnrealBuildTool : error : Expecting to find a type to be declared in a module rules named 'NvCloth' in UE4Rules, Version=0.0.0.0, Culture=neutral, PublicKeyToken=null. This type must derive from the 'ModuleRules' type defined by Unreal Build Tool. 1>C:\Program Files (x86)\Microsoft Visual Studio\2017\Community\Common7\IDE\VC\VCTargets\Microsoft.MakeFile.Targets(49,5): error MSB3073: The command "D:\Games\UE4\UE_4.21\Engine\Build\BatchFiles\Rebuild.bat CardinalMenuEditor Win64 Development "C:\Users\Bone\Desktop\CardinalMenu_Project_v181120_421\CardinalMenu_Project_v181120_421\CardinalMenu.uproject" -WaitMutex -FromMsBuild" exited with code -1. 1>Done building project "CardinalMenu.vcxproj" -- FAILED. I'm assuming you're the one who had problems with this and posted in the forums? If so, I'm glad you were able to figure it out by trying a different machine.